Gstaad is known as a major ski resort and a popular destination amongst high society and the international jet set. Gstaad has a population of about 9,200 and is located 1,050 metres (3,445 feet) above sea level. 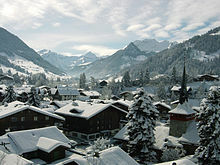 Gstaad, named "The Place" by Time magazine in the 1960s, is widely known for its famous part-time residents and vacationers. This article uses material from the Wikipedia article "Gstaad", which is released under the Creative Commons Attribution-Share-Alike 3.0 License.